100% Candice: You are not Guy Kawasaki - stop trying to be! You are not Guy Kawasaki - stop trying to be! Sharing links to other content is a strong part of any social media strategy. It's very valuable to be the person known in your industry for searching out all the important content and sharing it with your network. The average person does not want to read every industry trade, especially if it's from an industry they only use a few times, like mortgages, real estate, buying technology etc. So becoming the person in your industry who helps the average person get access to only the most important or informative bits of industry news is a worthy goal. Sometimes that goal is called "Becoming an expert in my industry"
As you see, sharing links to news about your industry is an entire piece of the puzzle. It's something you definitely want to put some work into. Sadly what I see a lot of on social media nowadays, both Twitter and Facebook, is that people are sharing links without adding any context whatsoever. I teach my clients to ALWAYS add editorial comment on the link they are sharing. 1. As a reader, I want to know why you think this piece of news is important for me to read instead of something else. How does this news affect me as a consumer of your product, or how does this news affect you as a seller of this product? You need to give me a reason why I should click on this link and read it. Just giving me the headline of the article makes you no different than if I was following the industry trade paper. All I would read there would be the headlines also, then decide if I want to read it. If I'm following you because you are an excellent Curator of content it is because you have made the decision for me. I know when you post something that I want to read it because I know why it is important to ME. 2. When you are constantly sending links, with no thoughts of your own added to them, the reader begins to realize that maybe you haven't actually read the articles you are linking to. Slowly you start eroding your reputation as an expert in your industry and begin to build the reputation of being an expert at finding automation tools. I don't know about you, but I want a mortgage broker who does spend time every day staying on top of the most important news. I want a well read, well informed person working on my behalf for the best possible deal. I don't want to hire my mortgage broker to teach me which content curation automation tool they think is best... which is what that person actually knows about. I only know one person in the wide internet famous world who got famous by doing nothing but sharing links, and that's Guy Kawasaki. But his secret is twofold. First, Guy Kawasaki was already a successful and well known guy, having authored a number of books, worked for many years with Apple, launched a handful of start-ups and acting as Chief Evangelist for a few technology companies. 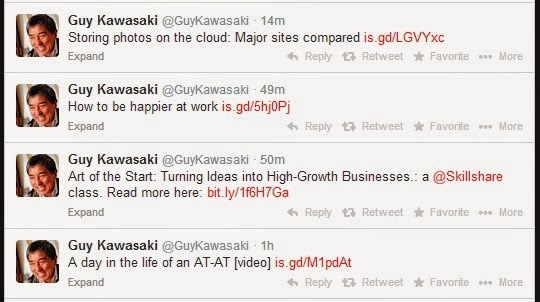 Second, Guy Kawasaki sent his first tweet in 2007, seven years ago, or in internet years, three generations ago at least! He was the first on the scene, helping people find great and interesting content on a World Wide Web which still had confusing search results, no easy to use news and RSS readers, no Pinterest! So, don't throw out your plan to find the most interesting articles from around the internet to share with your followers. Just put a bit more thought and caring into it. At least as much thought and caring you would put into answering your customers questions. ALWAYS add editorial comment with any link you share on social media.